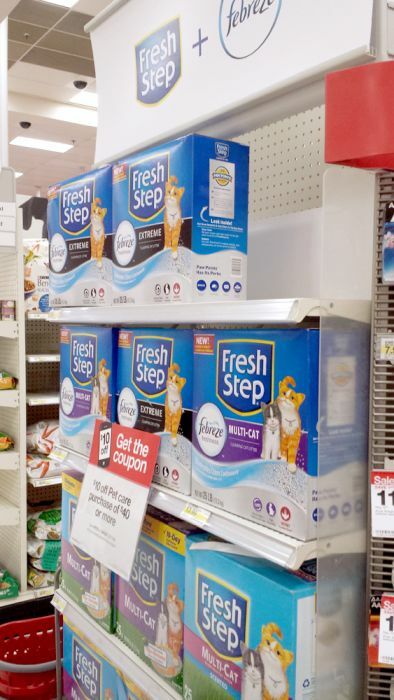 This is a sponsored post written by me on behalf of Fresh Step at Target. All opinions are 100% mine. Many cat owners know the feeling. You come in from a long day, open your front door and whoosh! You are greeted by the awful smell of a litterbox. Somehow, no matter how clean you keep it, it still stinks. Its a scenario I know too well – especially lately. My lovely Sophie has been ill, and on a special wet food diet. Suffice it to say that change has NOT improved the smell of her box. Thankfully, there is NEW Fresh Step® with the Power of Febreze™. 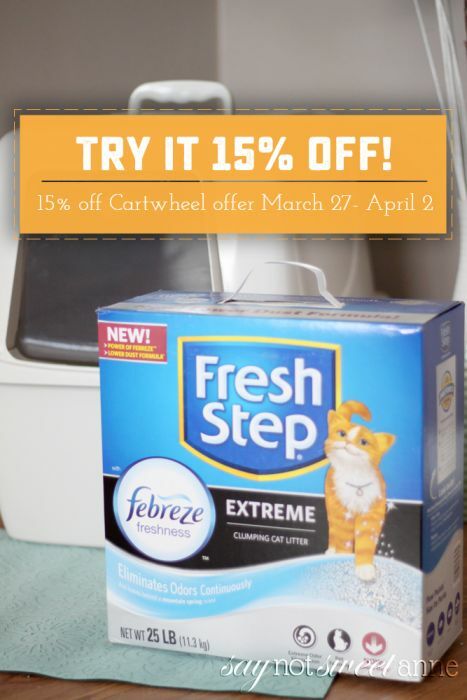 When I was asked to try new Fresh Step® with the Power of Febreze™, I’ll admit I was skeptical. Since Sophie’s box had become a problem, I’ve been scooping it twice a day, using several different brands of scented litter. Some put her off the box, probably because the smell so strong. Others did next to nothing to mask the smell. Still, I love Fresh Step® litter, and I’ve used Febreze all over my house to eliminate odors – putting them together in Sophie’s box had to be a good thing. So I stopped by Target and picked up a box of the new litter, cleaned her box and put it in. The litter is self was pretty low dust – which is a plus. Straight off Sophie used the box. That is huge! The scent was pleasant to me, but wasn’t too strong for kitty. I waited until the end of the night and then scooped. The litter clumped really well in the solids and the liquid waste. The litter smelled nice, and the cat odor was almost unnoticeable. I keep a garbage can beside the box – and I couldn’t even smell the scooped waste. The box says that the Fresh Step® with the Power of Febreze™ eliminates odors, not just masks them, and that seems to be the case! 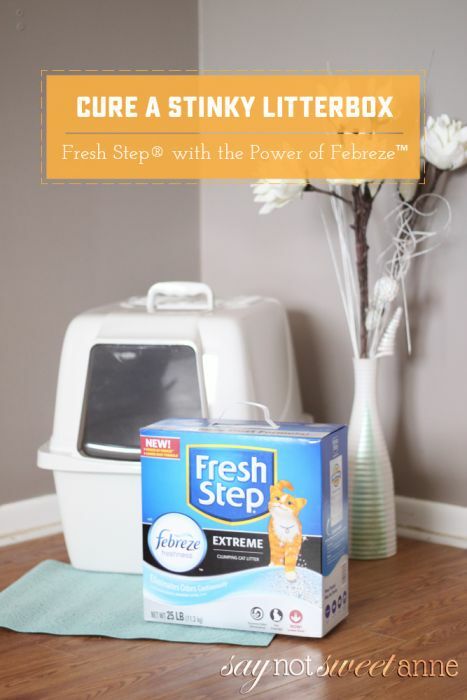 So far I’m really pleased with the Fresh Step® with the Power of Febreze™ Litter. Even with her special food, Sophie’s Box doesn’t stink and the garbage can for her scooped waste doesn’t either! You don’t have to take my word for it though, you can Save 15% with Cartwheel. Go grab a box and report back. 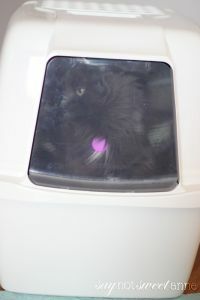 Did it eliminate odors in your cat’s box? Share a picture in the comments section!